What's better than an excellent American Lager during warm summer days or at home when winter strikes? Discover the most popular beer from Brooklyn Brewery! "Short BBE* date 20/06/2019. After this date, the beer is still perfectly drinkable, but may lose some of its flavour or nutritional value. *Best Before End"
This beer is the greatest achievement and success of Brooklyn Brewery. Based on a recipe dated from before the American Prohibition, it stands for the best Lager beer in the US. 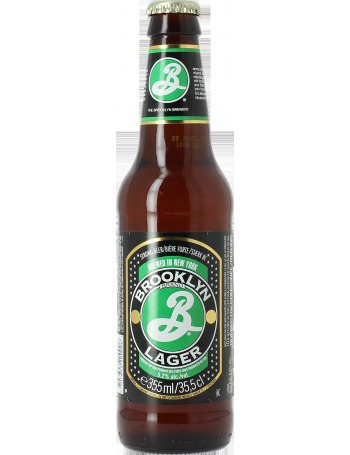 Visually, the Brooklyn Lager pours a nice blond colour specific to lagers and topped by a thin beige head. The floral aromas released prove that the dry hopping technique was used during brewing; the whole is finely balanced thanks to the malty notes. In the mouth, it features light and soft flavours that lead us towards a fine bitter finish. This beer belongs to the High-quality Lagers produced by numerous American Breweries, it has been rewarded many times: Gold Medal in the “Championship Beer Festival” in 2010 and 2011, but also the Hong Kong International Beer Awards Winner in 2010.